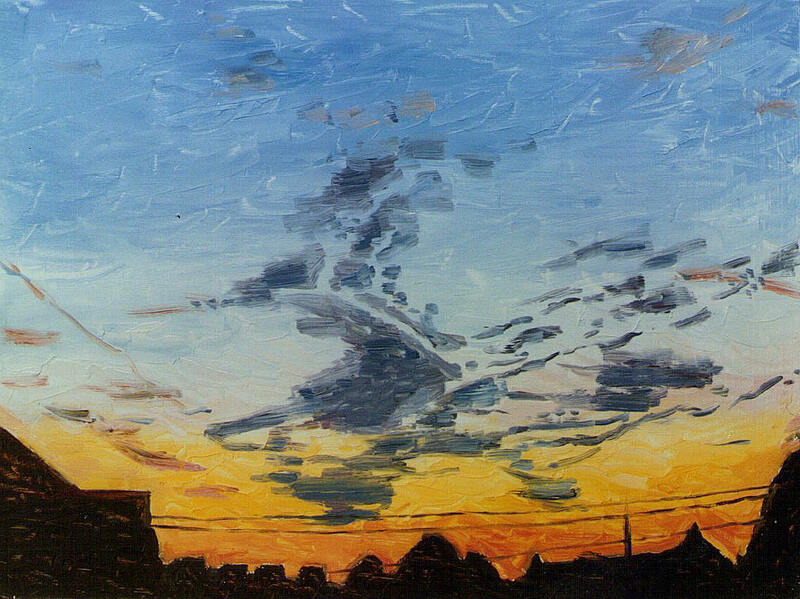 In an attempt to paint an evening landscape, the artist may automatically use lots of black paint. A little brown or grey may be included to provide variations to the dark colour, resulting in dirty monochromes that fails to convince. What colours should the artist use to paint a dark landscape? The artist painting a moonlit landscape may experience a dilemma between what the brain knows about the scene and what is seen; the objects are bright in colour, and yet they appear subdued. Adding black to all the colours normally seen in a landscape. For instance, mixing green with black to render a dark meadow or mixing blue with black to express a seascape set at night. Illustrating all objects in a moonlit landscape as being lighter on one side than the other. Delineating silhouettes with the same black and using it in an illustrative way, such as painting branches or chimney pots, resulting in a painting that lacks depth. Painting the moon merely white and without any variations in tone. Flecking white dots over the night sky to express stars. Colours cannot be detected at night time, causing objects to appear monochromatic. But any light that shine upon an object will reveal its colour. This means that a partially-lit landscape, such as one set in the evening or by streetlight will consist of two colour palettes: monochrome and full colour. The degree to which the object is illuminated will affect how colourful it will appear. This means that an object lit under subtle lighting, will have soft colours. Ultramarine, pthalo blue, burnt sienna, burnt umber, permanent rose and varying amounts of white. A landscape under moonlight often contains a lot of blue, and sometimes violet. Mixing ultramarine and permanent rose with a little white will result in rich violets often seen on clear nights. Mixing pthalo blue and burnt umber with a little white will result in a bluish neutral colour often seen on moonlit snow. Rich darks, such as those found in deep shadows can be achieved by mixing pthalo blue with burnt umber, or ultramarine with burnt sienna. Darks also have different colour temperatures, some being warmer than others. Using contrasting darks will add richness to a moonlit painting. It helps to paint dark to light when rendering a landscape set at night. This means applying a thin wash of neutral or grey colour over the art board prior to painting. This will help set the tones of the night time landscape, for painting straight onto white will give a misleading impression of the paints’ tonal values. Starting with the mid tones will help the artist accurately measure one tone against the other, which is what painting a moonlit scene is all about. Close observation will reveal that the moon is not just white, it can be eggshell, china blue or even pink, depending upon the atmospheric conditions. A crescent moon will have tonal variations, not just a half-moon cut-out shape. Similarly, stars have different colours, some appear gold, others look blue. Silhouettes of trees, rooftops or lampposts, consist of different darks and outlines. Silhouettes far away will have softer textures and darks than silhouettes that are close by. They will also have different brush marks, some softer than others. The key to a convincing painting of night is close observation of the subject matter. The portrait artist painting teeth for the first time may end up with pegs that look too teethy or goofy. 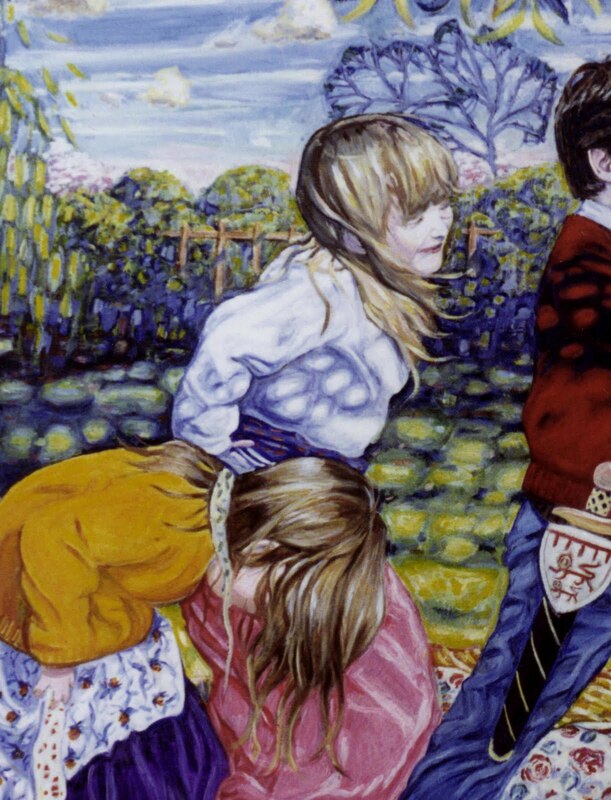 The teeth look too square, white or harshly defined, creating an unwanted focal point to the portrait painting. How can the artist paint teeth that look natural in portraiture? Allowing generalisations about teeth to leak into the portrait painting, such as the following: All teeth are square in shape, the gaps between the teeth are black and equal in width and all teeth emerge from red gums in equal measure from the top and bottom of the mouth. Using only white to represent the enamel colour of teeth and then darkening the colour with black or grey. Treating teeth as separate entities to the rest of the portrait. Not altering the tone or colour of each tooth, but using the same hue for each, resulting in flat-looking teeth. Forgetting to check the photographic reference when painting teeth. 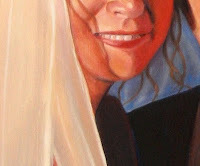 The following tips on painting teeth will help contribute to the overall quality of the portrait painting and create a more desirable focal point along with the eyes. Teeth are rarely just white but other pale hues. The colour of teeth can vary from ivory to tea-coloured. Even teeth within the same mouth will often vary in colour, whether locally or through shadows. Look out for blues, browns, violets and beiges in teeth. Look out for shadows on various areas of the teeth, such as that cast from the upper lip and where the back teeth retreat into the mouth. Shading will also define the shape of each tooth, particularly where the edges round off. Take notice of the different shapes and sizes of teeth. The bottom teeth are often a little narrower than the upper teeth. The two front incisors will often be the most prominent. If necessary, count the number of teeth in view on the photograph and echo this in the painting. The colour of gums is often subtle rather than bright red. The divisions between teeth and gums are also soft and require a little blending to prevent harsh lines from drawing the eye. Shadows will often darken the gums almost to black. Highlights can often be found on gums too, which provides a great opportunity for the artist to make the gums look more convincing. Take extra care when rendering outlines to teeth, which will easily look harsh and make the portrait jar. It may often be necessary to blend outlines with a soft clean brush. Similarly, it helps to view the lips around the teeth as an extension of the teeth, rather than as separate entities. Observe how the lips and teeth relate to one another in the painting, for example, how the tonal values of the teeth compare to that of the mouth. Fine sable brushes are crucial when painting detail around teeth. Start from the pale colours and work to the darks. This will prevent a neighbouring colour from contaminating the pale hues of teeth. Half-close the eyes to gauge the tonal value of teeth. Avoid loading the brush with too much paint or this will make the detail hard to manage. Wipe off excess paint onto a rag and mix a little linseed oil into the paint for the detail. Don’t use black to express outlines and dark areas. Instead, introduce a little violet into the pale colour and blend any gradations in shades. Apply the darkest areas and highlights last. If a mistake is made, blot the paint off or soften it with a clean sable. I often mix a little burnt sienna and ultramarine into my white to render teeth. With just the right amounts, this will result in a pearly colour most often found in teeth. Gradations in shades can be provided by adding a little burnt umber, or a mixture of ultramarine and permanent rose, which results in a cool violet, ideal for shadows beneath the upper lip and the back of the mouth. The finishing touches often are highlights, provided by dragging a little neat white paint onto selected areas of the teeth. 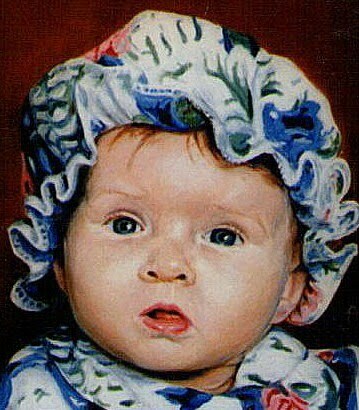 The novice portrait artist may illustrate subtle contour shifts on a baby’s face as lines or definitive shading, making the baby look more like plastic than soft flesh. Baby’s features are given outlines, such as around the eyes or mouth, resulting in an illustrative rendering of a baby, which may look more adult. 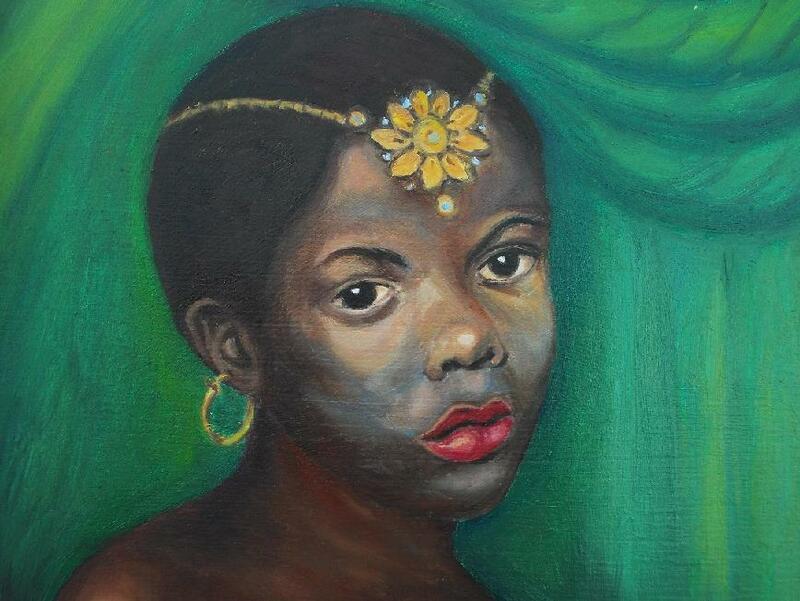 How does the artist capture the essence of a baby’ face? Treating all features of the baby’s face, such as eyes, mouth, nostrils and nose as separate entities and outlining each with a line. Expressing in a linear way contour shifts on the baby’s face, such as cheekbones, Cupid’s bow, ball of the chin and temples. Again, using lines to express creases on the baby’s face, such as a furrowed brow, smiling lines or double chin. Mixing white with red or using a tube of “flesh tint” for the skin colour of a baby and then trying to darken the colour with black or dark brown for shadows. Applying any blue, brown or green for the baby’s eyes and using white for the eyeball area in a “painting by numbers” fashion. Rendering the baby’s hair with linear brushstrokes that look the same all over. Working from memory or poor photographic reference, forcing the brain to fill in the gaps and make assumptions, resulting in a baby painting that looks more like a small version of an adult than a true rendering of a baby. Flash photography. This will bleach out the baby’s features and any facial contours, resulting in a flat representation of a baby’s face in the painting. Blurred photography. This will make it impossible for the artist to bring out detail, such as the eyelashes, highlights or dimples. A photograph showing baby’s face too small. Again, this will make it impossible for the artist to portray the baby accurately. For this reason, I often produce my own photographs when commissioned to paint a baby portrait (since baby’s have a habit of fidgeting). The following tips on child portraiture will help. The best photograph of a baby is ideally under natural lighting, such as outside or near a window. Avoid backlight, as this will make baby’s face look dark. Sidelight will bring out the contours of the baby’s face. Sunlit conditions may benefit from a fill-in flash or a reflective surface to soften shadows. Use a high resolution setting to capture detail and take several photos rather than just one. 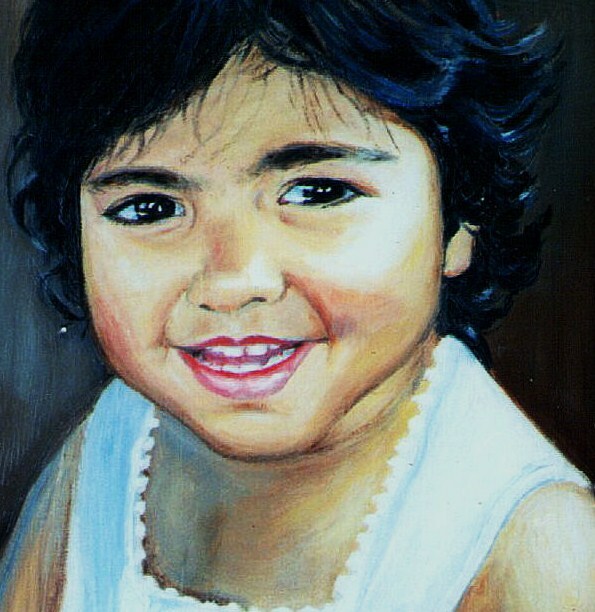 The following tips on painting a baby’s portrait will help the artist get to grips with the challenges ahead. Baby’s features have different proportions to an adult, as the features are closer together and cheeks, brow and chin consist of flat planes with few lines. To avoid adult characteristics from creeping in, remember to keep looking at the photograph. If necessary, turn it upside down. Keep standing back from the painting to get an overall impression. A tonal shift in the baby’s skin is better expressed by adding a little complimentary colour (or opposing colour) to the skin colour itself, which in the case of a warm fleshy pink, will be blue or violet. Reserve black for the baby’s pupils. Baby’s faces rarely show lines. It is better to introduce a little white into the mix and illustrate any small creases beneath baby’s eyes or mouth as paler than the surrounding area and then mixing a slightly darker colour and applying it to selected areas to suggest depth. Baby’s eyes will exhibit many variations in colour, such as highlights, reflections and colour shifts. The eyeball is rarely just white but darkens where it disappears into the eye socket. What Colour is Baby’s Flesh of Different Races? Look for unlikely pigments in the colour of baby’s skin. This may include violets, blues, brown and even greens. Mix the skin colour of the baby from scratch and avoid using more than three colours for any mix and avoid using tubes of “flesh tint”. 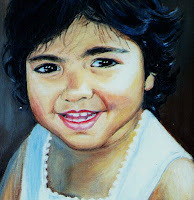 Depending upon the race of the baby, I find the following oil pigments provide a good foundation for child portraiture. These are suggestions only. In real life, some colours may be omitted and other colours may be found. Caucasian baby: White, cadmium red and burnt sienna for warm colours and highlights; permanent rose, burnt umber and ultramarine for cool colours and shades. Half cast or olive skinned baby: White, burnt sienna and a little burnt umber for warm colours and highlights; Burnt umber, burnt sienna and pthalo blue for cool colours and shades. A tiny amount of viridian green can sometimes be found in dark skin. Black baby: White, burnt umber and ultramarine for warm colours and highlights; burnt umber and pthalo blue for cool colours and shades. Soft brushes such as sables are a must for child painting. I often complete the baby or toddler portrait in a series of thin glazes. This entails mixing a little linseed oil with the paint and allowing each paint layer to dry before applying the next layer. I often work from mid-tone to dark and light, finishing off with the highlights and the darkest shadows of the baby’s face. The key focal point to a dog portrait will rest on the eyes, which could ruin the artwork if they stare lifelessly from the oil painting as though made of glass. In some cases, they appear stuck on the dog’s head like pieces of paper, in others, they lack expression or character. What tips for the pet artist will create realistic and expressive dog’s eyes in portraits? Subconsciously allowing human characteristics to leak into the eyes of the dog portrait, such as illustrating idealised almond shaped eyes, painting pupils and irises too small on the eyeball and painting eyelashes as curving from the edges of the eyes. Using merely white to illustrate the eyeballs and reflections on the eyes. Rendering dog’s eyes in a “painting by numbers” way, such as: representing a round black dot for pupils; filling in the irises with any brown, blue or green at the artist’s disposal, and finishing off with a dark outline around the eyes. Leaving areas around the eyes blank, such as the dog’s brow, temples and bridge of the nose. 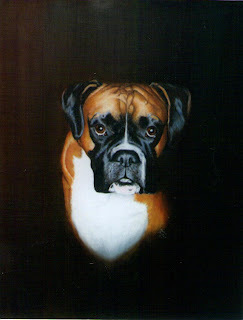 The following advice for pet artists on painting dog’s eyes will help capture the true essence of a dog’s character. Close observation is the key to painting realistic dog’s eyes in a portrait. Turning the photo upside down will help the artist override the dictatorial part of the brain that favours painting by numbers and making generalisations about how a dog’s eyes “should” look. Doing so will break down the area into abstract tonal shapes and colours. The following tips will also help. The eyeballs of dog’s eyes are rarely just white, but contain a multitude of other colours, including blues, violets, earth colours and crimsons. Dog’s brows will cast shadows over the eyeball, and may darken it to almost black at the point where the eyeball disappears into the eye socket. Highlights and reflections within the eyes are not merely white or round in shape, but often contain gradations of other colours, often blues and crimsons. Look out for objects reflected on the eyeball, creating odd shapes. Similarly, the colour of the dog’s irises will vary according the shadows and reflections falling over them. The degree to which the eye is open or the shape of the upper eyelid will have a fundamental effect upon the expression of the dog and therefore its character. Revealing too much upper pupil will make the dog look surprised; revealing too little will make the dog look sleepy. Pay special attention to the contours around the dog’s eyelids to capture the dog’s expression and character. Pay attention to veins, tear ducts, upper eyelids and lower rims of the eye, which often appear droopy, as in bloodhounds. Not all such tissues are red, but can apparently appear crimson, blue, brown or even black. Treating the skin around the eyes as an extension of the eyes themselves will help capture dog’s character and make the eyes look more convincing. This entails breaking down the area of the temple, brows and bridge of the nose into abstract shapes and lines and rendering them truthfully. Burnt umber, burnt sienna, ultramarine, pthalo blue, permanent rose, cadmium yellow and white. For highlights I will use white, ultramarine, permanent rose and burnt sienna. I reserve black only for the darkest area of the pupils. Soft fine round sables are essential for detail around the eye area. Sizes 3 and 6 would be ideal. Begin with the larger areas and work down to the small. Avoid applying paint too thick, or it may smudge or contaminate the neighbouring area. Thin the paint with a little linseed to make it more manageable and wipe off excess paint with a cloth. I often work from dark to light in a series of glazes, allowing the previous paint layer to dry. Highlights are applied last, via little strokes of neat paint. It is vital to keep looking at the photo when painting a dog. 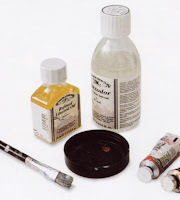 The speculating oil painter may be bombarded with numerous products and conflicting advice on the essentials of oil painting, giving the impression that a complete oil painting kit should consist of dozens of oil colours, art brushes, solvents, mediums and a studio easel. But this need not be the case. 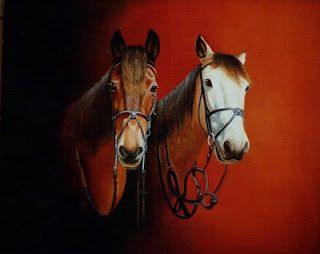 In fact, oil painting can be made cheap and simple. Where can I Get Cheap Art Materials for Oils? A large tube of titanium white. Viridian green: A much-maligned colour for its strength, but when mixed with other colours, provides beautiful greens. Avoid purchasing preselected sets of oil tubes, as they often contain unnecessary colours, such as numerous earth colours or secondary colours. A one-off purchase of the aforementioned oil tubes will spread over dozens of medium-sized oil paintings, and will last years. 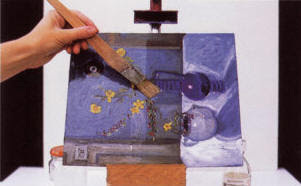 Art brushes for oils are essentially divided into two types: stiff brushes, most often hog hair for rough impasto, and soft brushes, most often sables, for blending and detail. The artist may save money on art brushes by purchasing the stiff brushes from DIY stores. But it is worth investing money in good quality sables that last. Kolinsky is a well-established brand, but brushes containing a blend of synthetic and sable provide a cheaper alternative. Two or three different sizes of each will suffice the artist for many art techniques. The following starter kit of art brushes will not break the purse strings. Sable brushes Sizes 3 and 6 rounds. (Rounds are brushes that converge to a point for fine lines). Hog hair brushes sizes 6, 9 and 12 flat. (Flat brushes are brushes with a flat, blunt end for wide brushstrokes). Where Can I Get Cheap Art Boards? The purchase of canvases and art boards can make the cost of oil painting skyrocket, but preparing your own is simple and will save lots of money. Simply purchase a tin of acrylic polymer primer (sometimes labelled “gesso primer”), which is essentially a white acrylic, water-soluble paint that dries water resistant. Applying a coat or two of acrylic primer onto thick paper or card will provide a stable surface for oil sketches. Textured paper, such as “not” watercolour paper will provide interesting effects for painting. MDF or hardboard can be used for larger oil paintings. 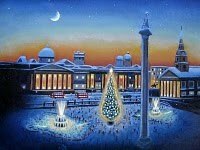 But if stretched canvases are preferred, stationers will often stock them at the fraction of the art shop’s price. What Art Mediums do I Need for Oil Painting? ﻿Any non-porous material can be used as an artist’s palette. A china plate, a piece of plastic or veneered wood would be ideal. I stretch a piece of cling film over a sturdy surface via bulldog clips. When I am finished, the used cling film can easily be disposed of. Easels can be dispensed with by resting the painting surface onto a backing board via bulldog clips and propping it against a table edge or lap. 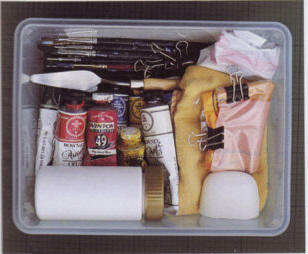 All the art materials can be stored inside a tool box, which is a cheaper alternative to an art box. The tool box is sturdy and opens out in tiered drawers, ideal for the storage of oil paints, drawing materials and art mediums.